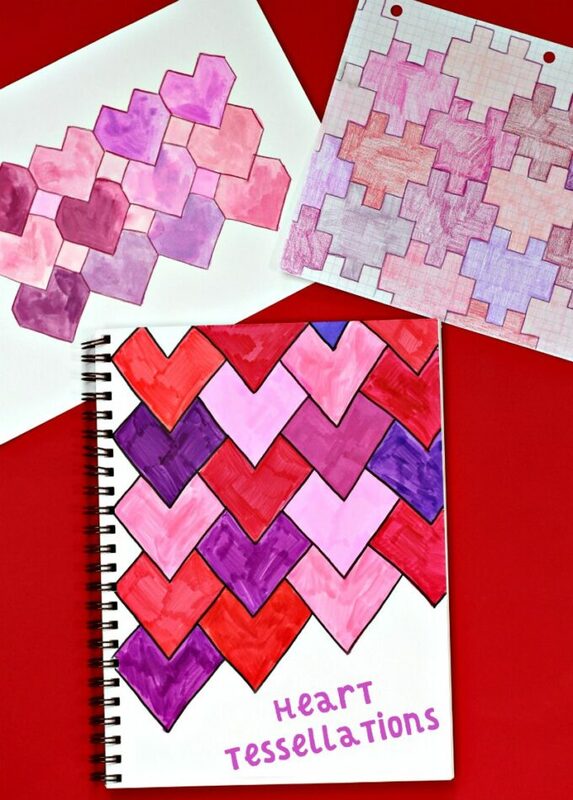 These heart tessellations make a relaxing art project, especially for kids who like patterning, and repetitive doodling. Art doesn’t always have to mean drawing still life, after all. 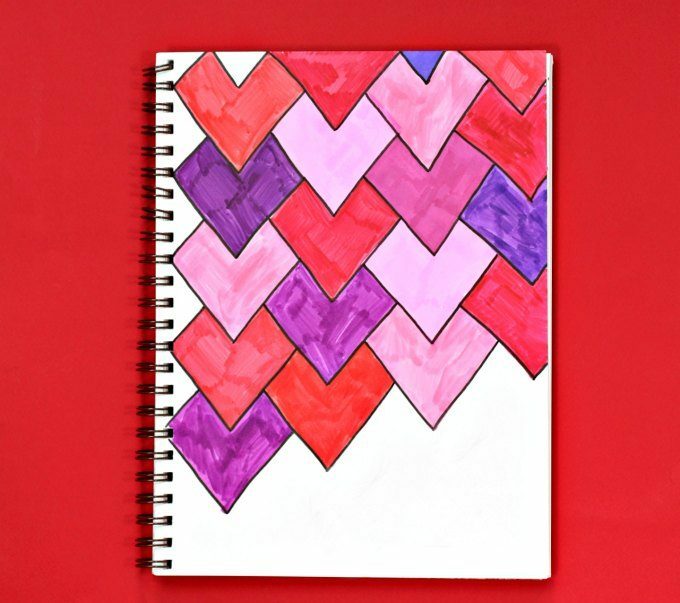 Combine this math art project idea with Möbius strip hearts and you and your kids can celebrate Valentine’s Dayin style. Made famous in popular culture by M.C. Esher, tessellations are repeated patterns in which shapes fit exactly together. Esher’s tessellating patterns are composed of fantastical shapes. Floor tiles or brick patterns are examples of commonly found tessellations. Honeycomb is a good example of a tessellation found in nature. All kinds or tessellations are examples of the way mathematics makes the world fancy! Scissors. These are my favorite kids scissors. Art paper, or art journal. This is my absolute favorite art journal EVER, which I talk about all. the. time. Art supplies such as colored pencils, markers, etc. Step 1. Create the heart template. This took a bit of experimentation on our part to find the right angle for the bottom point of the heart. We finally decided on an 80 degree angle, which we drew with our protractor. Be sure that the measurement of side of the heart is twice as long as one of the top “sides” or your tessellations will be off. Our measurements were approximately 6 cm and 3 cm. 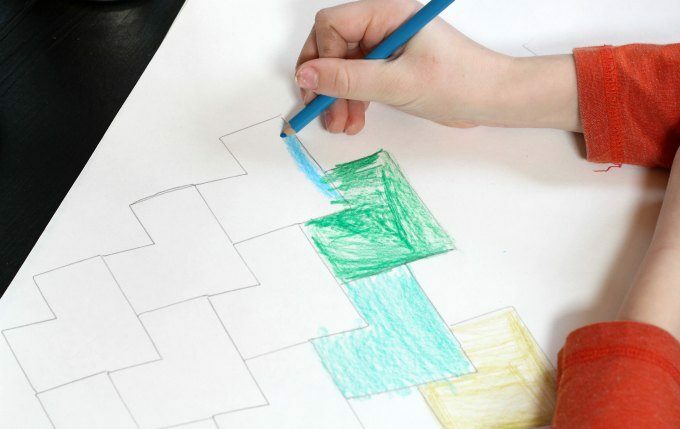 Cut out the template on thin cardboard and trace a couple of practice tessellations to make sure your template is accurate. Trim template as needed. 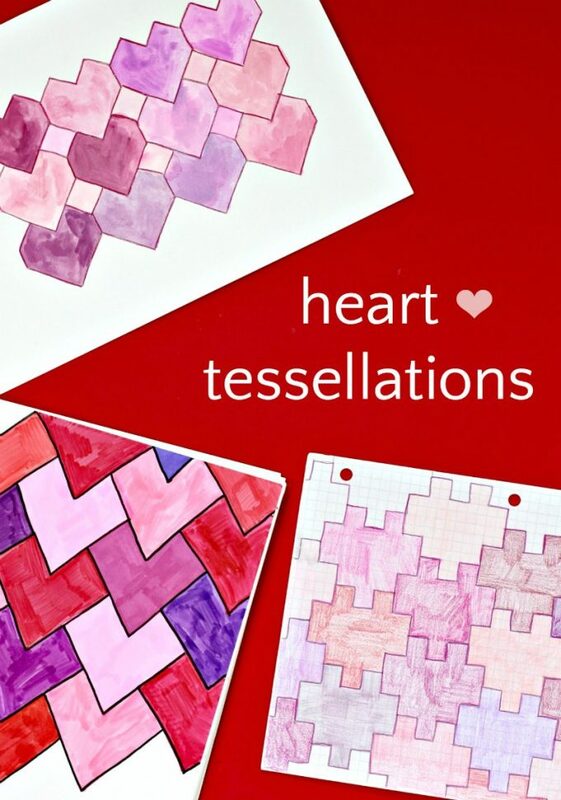 If you are creating the template in a classroom, this is a good place to discuss how to create a perfectly symmetrical heart and how exact measurements are necessary to make perfect tessellations. Creating the template by hand and not a computer means it is very difficult to make a perfect angular heart. But perfection is not necessary! The slight imperfection of the template and the resulting traced tessellations are a good lesson in how mathematics works in real life. Step 2. 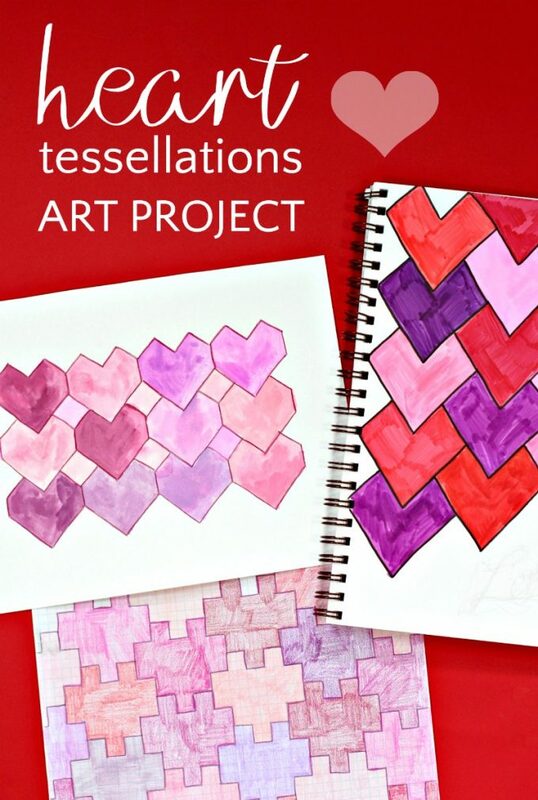 Trace your heart template on paper and tessellate! Step 3. Color as desired. In contrast to the above heart template method, these tessellations will be mathematically perfect. Children can even create them using a computer if you have an appropriate program. 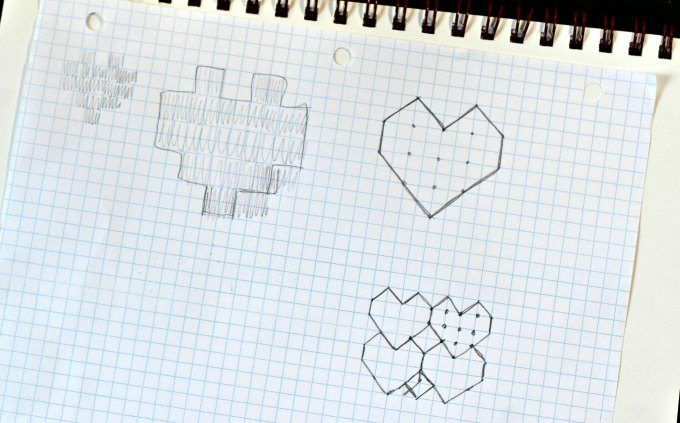 However, drawing the heart math art out on paper is also very satisfying. Step 1. 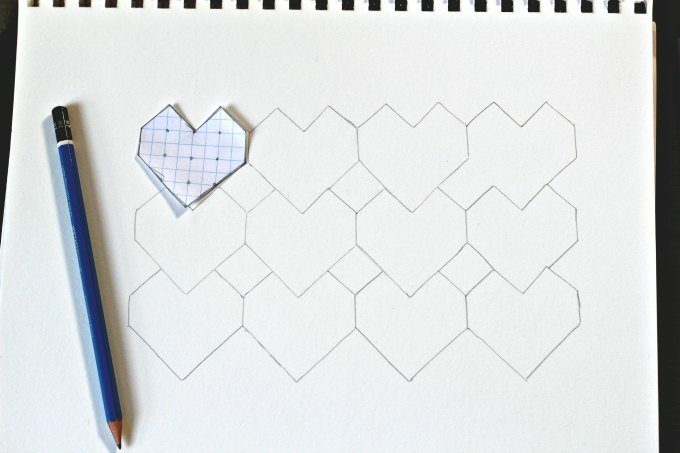 Draw the outline of the heart tessellation as shown and fill the paper. Step 2. Color as desired. Step 3. Admire your handiwork. 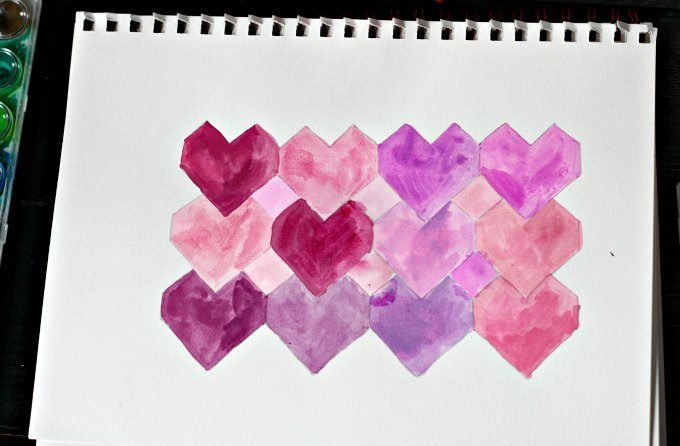 I really wanted to make tessellations that more closely resembled a traditional heart shape than the designs above. So with some experimentation this heart and square design emerged. Watercolors or other coloring medium. I love this tray of paints. Perfect for both kids and adults. Step 1. 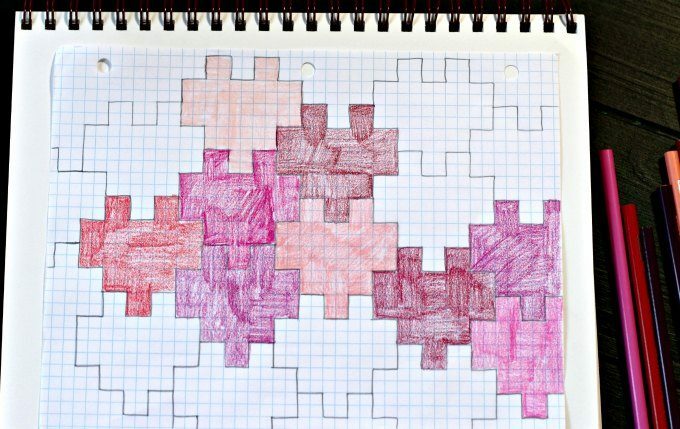 Create a template using the graph paper and cut out. Trace template onto thin cardboard as in the first example, if desired. Step 2. Tessellate hearts as shown. Notice that as you match the sides of the hearts, a square “hole” forms between the hearts. Step 3. Color as desired! Step 4. Admire your beautiful math artwork! There you have it! Heart tessellations three different ways! 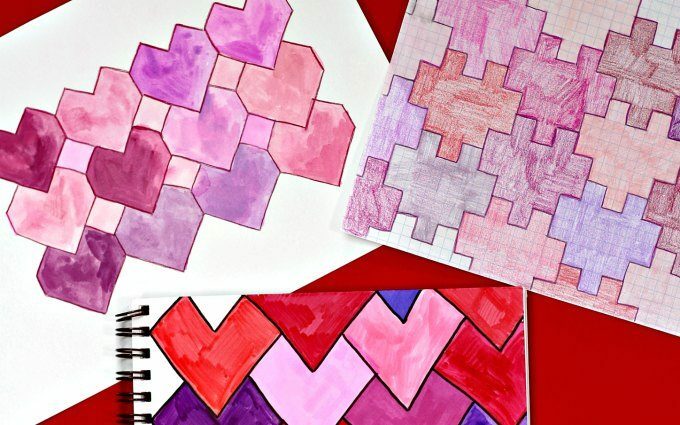 Even though I encourage you to try this mathematical wonder any time of the year, this math art idea makes a great STEAM project for Valentine’s Day. Know what also makes for great Valentine STEAM inspiration? The STEAM Kids book I co-authored! 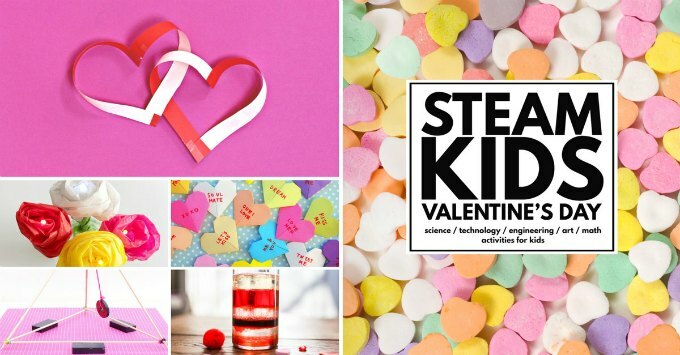 Chock full of other super duper fun love and heart themed STEAM projects for kids ages 4-10. Learn more about it here: STEAM Kids Valentine’s Day ebook. Maybe this is lazy of me but I would LOVE a template (or two or three!) for the hearts! 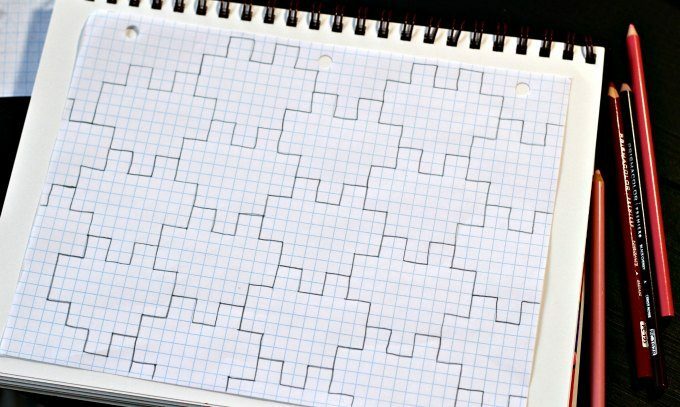 I don’t have any graph paper on hand and I’m struggling to get a template just right. A printable would be so appreciated!